With the showroom is over 400m2, luxuriously designed, modern, airy in accordance with the standards of the Global Ford. The waiting room is equipped with television, internet, magazines for your comfortable relaxation while waiting for getting the cars or business contacts. Besides, there is also the playing and entertainment area for children. 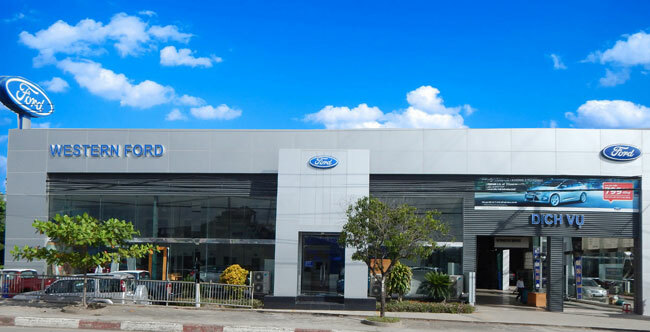 Coming to Western Ford, customers are warmly and solemnly welcomed by the team of more than 30 sale consultants who are professionally trained and are cheerful, enthusiastic, self-confident, dynamic and experienced. We are willing to recommend you to choose the most suitable cars for your demand with variety of Ford vehicles that are currently available on the market. Besides, we provide genuine accessories, original and various options, spare parts to meet every taste of the customers for car decorations. – To meet customers’ demands on getting new cars and clearing old cars, we carry out the program “Collecting old cars, getting new cars” with the best guarantee of rights for customers. – Customers can pay directly in cash or pay in instalments through banks or financial leasing companies. We associate with most of the banks and financial leasing companies in cities or provinces with a loan from 10% – 85% and with fast procedure. Our motto for the business is: “All for the benefit of customers”.